No matter what happens in the fight over whether to expand Virginia’s Medicaid program, one thing is certain — a split between many mainstream business interests and the state GOP has grown wider. Sure, there’s still plenty of low tax, anti-regulation fervor from General Assembly Republicans, positions that generally please the business community. But for better or worse, knockdown fights like the Medicaid standoff and last year’s transportation funding package are doing damage to a relationship that used to be a lot closer. “Normally, business interests like chambers of commerce and hospitals can count on pretty cooperative Republicans and legislatures. But that traditional alliance has really broken down,” says Stephen Farnsworth, political science professor at the University of Mary Washington. The issue proved to be the sticking point in passing a state budget in this year’s General Assembly session. In mid-April, the impasse still was unresolved. Medicaid expansion was part of the 2010 Affordable Care Act, but the U.S. Supreme Court ruled in 2012 that states could opt out. Expansion supporters were cheered when Democrat Terry McAuliffe was elected governor last fall after making the issue a centerpiece of his campaign. In the Virginia Senate, supporters got behind Marketplace Virginia, a proposal from state Sen. John Watkins, R-Powhatan, to funnel federal money into buying private-sector insurance for many of the state’s uninsured residents. 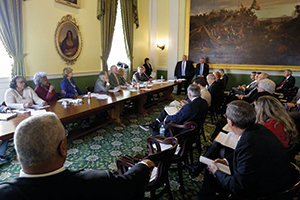 The private-option alternative has garnered support from A Healthy Virginia Works, a coalition made up mostly of hospitals, the Virginia Chamber of Commerce and many regional chambers of commerce around the state. The coalition has released a number of letters from business leaders and former members of the administration of Republican Gov. Bob McDonnell urging adoption of the plan. Republicans in the House of Delegates, however, detest the ACA. They don’t trust the federal government to keep its end of the bargain to cover the cost of expanding coverage. Delegates also see nothing politically to gain from backing expansion but everything to lose. Consider last year: Two 20-year veterans of the House of Delegates, Republicans Beverly Sherwood of Winchester and Joe May of Loudoun County, were beaten in GOP primaries in June 2013 by more conservative candidates who blasted their support for last year’s transportation funding bill. “From the point of view of Republicans in the House of Delegates, siding with a Democratic governor and anything to do with Obamacare is a political death warrant,” Farnsworth says. Supporters acknowledge the hard politics of the issue but can’t believe opponents are passing up a chance to siphon so much federal money. “It’s incredibly ridiculous,” says W. Sheppard Miller III, chairman of KITCO Fiber Optics, a Virginia Beach-based defense contractor. Not all business groups back Marketplace Virginia, however. Nicole Riley, state director for the National Federation of Independent Business, says smaller businesses might not face a direct impact the way hospitals would if Medicaid expansion fails, but they would see a weaker overall economy if more tax dollars are put into that program. “They certainly feel that it’s bad policy, and that in the end, they’re going to be the ones holding the bag,” she says. Lansing also argues that Medicaid recipients get worse care than people covered by private-sector insurance. Like most opponents, he wants to let the state’s Medicaid Innovation and Reform Commission keep working. The legislative group was formed last year. “That’s why I think the audit of Medicaid is so important. We need to figure out what works and what doesn’t,” Lansing says. Medicaid supporters say that’s just a stalling tactic because they believe Republicans on the commission will never approve expansion, no matter what changes are made. “What Republicans are doing in the House is saying, ‘The model we have needs reform,’ when in fact it doesn’t. We’ve been doing managed care in Virginia for 19 years,” says Doug Gray, executive director of the Virginia Association of Health Plans. Gray and others say the staunchest opponents are tea party-backed candidates who won office by running in low-turnout primaries in gerrymandered districts. “The real issue is redistricting. That’s why this is happening, because the House is out of touch,” Gray says. “They seem to think, and this goes back to redistricting, that they can get away with it without any concern,” he says. Farnsworth agrees. “Redistricting plays a key role here. The real action is in the [Republican] primaries. You have to satisfy the most conservative 5 percent of your electorate” to win, he says. That formula has worked for House members, but it might stop there if the GOP alienates moderate voters. Democrats control both U.S. Senate seats and the top three elected posts in Virginia. “This is a real problem for the Republicans. The Democrats did not win all five offices by accident,” he says.